I have had a stationery fetish my entire life. Pens, pencils, paper, and their kin are always among my favourite things to collect and use. 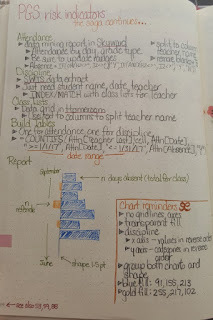 When I was a classroom teacher, I always kept a paper gradebook and planner, even as more and more capabilities became available in the digital space. Since moving into other roles in education, and the advent of tablets and smartphones, I've tried lots of combinations of tools to manage my calendar, tasks, and projects. It is perhaps no surprise that I've finally settled into a paper-based routine that I love. Out in the world, when people see me use it, they ask me about it. I thought I'd share it here. Make no mistake, an Outlook calendar is used to organize most of my time. This is because so many meetings are scheduled through that tool. I don't sync it directly to my phone, however, to avoid public disclosure issues. (I don't ever sync work email to my personal phone, either.) But, I do import it into Google and then connect to a personal account. Yes, this is some extra work (about two minutes a week) and what I can see on my phone isn't always current. I sleep better, though. On my desk, I keep a life planner from Erin Condren. I love being able to see a whole year at once, even though I wish it was a school year as opposed to a calendar year. (They do make lesson plan books for teachers that are organized by school year.) I have a color coded system I use to put dots on days of the monthly layouts to help me easily scan for the regular meetings and events. I am also not averse to using stickers, even at my advanced age. I add them for birthdays I need to remember or appointments or other unusual events. I like that all of this gives me something that is both functional and pretty to look at. Maybe the pretty part shouldn't matter, but it does. Each week, I use the layouts to track appointments and tasks for each day. I put the meetings in the box on the right of each day, including the topic and begin/end times. In the lined area, I write my tasks. This becomes an invaluable place to jot reminders when someone asks for something over the phone or has just stopped by the office. I check things off as they're completed. Anything left at the end of the week gets copied over to the next week. Sometimes, there are tasks that get ported over for awhile. But usually, it feels darned good to see all those little boxes checked at the end of the week. 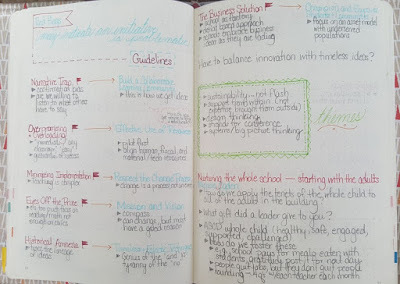 I have long admired the bullet journals that so many people use. I do apply some elements of the system to my paper calendar. I love my calendar, but there is so much more about work (and life) that I can't capture there. So, I started using a bound notebook (Leuchtturm 1917 dotted) to capture everything else: meeting notes, projects for work, information about data to remember for next year, movies I've watched, poems, or anything else that interests me. For example, here are some notes from the recent ASCD conference. And here is what my data notes look like. You might recognize the more polished product in a recent post, but it all starts here. I try to capture as much as I can about how I construct things in Excel: where the data came from, how I cleaned it, the formulas used to transform it, and how the charts were built. This always comes in handy later, when I'm asked to do something similar. A couple of other things to note about this page, both having to do with how I overcame my inertia in starting this type of journal. I had long thought---incorrectly---that when starting the journal I would need to have the whole thing mapped out. And this overwhelmed me. I just couldn't figure out how many pages I would need to devote to each topic. Finally, I realized that I didn't have to. First of all, I can "thread" pages. They don't have to be right next to each other. I just need to know how to find them. So, in the lower leftthand corner, you'll notice a note to myself about the previous pages in the book that I used to work on this same project. If I need to, I can look back at them very quickly to see all of my notes and the evolution of the project. The second thing I do is that I use a piece of coloured Washi tape at the edge of the page to signal when I'm changing topics in the journal. I might have meetings for 8 pages...and then it changes to a data project. Over time, this becomes a visual of how I have spent my time over several months. The edges of the pages become a sort of bar chart. I love that this little journal fits in just about any purse that I have. I can have it with me all the time to record ideas. I like being able to write, draw, or tape in whatever I like. Most importantly, I appreciate that it really captures how I spend my time. So much of my work is intangible---sitting in meetings or trying to figure out how to complete certain projects. This little book makes me feel like time didn't just disappear. One journal lasts me about six months. My go to, all time, super duper, favourite tool for writing is a Palomino Blackwing pencil, with a nicely sharpened long point. If you haven't tried one of these pencils, the kind used by John Steinbeck, Chuck Jones, Stephen Sondheim, and others...do yourself a solid and get some. I have gotten several people addicted to them over the years. They were all skeptical, but in the end, a pencil is not a pencil is not a pencil. Beyond that, I carry about 20 Staedtler Fineliners with me at any given time. I love the colour selection, the way they move on the paper, and again...even though it shouldn't matter...they make things pretty. Considering that most of what gets contained in my calendar and journal is work-related, having something pleasing to look at is far more motivating. The little tool bag in my purse also carries a small ruler, some 2x2" sticky notes, a pack of Zebra Mildliners, and a pencil sharpener. At home, I have been collecting a wide variety of Washi tape, which I also use to dress up my notes. I may need a 12-step program to manage this habit in the future. In the end, how we manage our time and information is always personal. I love looking through the following hashtags on Twitter for ideas: #bujo, #bujoinspire, #studyblr, #studygram. What works for you? For the past couple of years, a colleague (and friend) of mine and I have been sharing some ideas around human-centered design at conferences. We've presented to early childhood educators, principals, assessment coordinators, and others. The presentation is not so much a "how to" guide, but rather an attempt to shift the narratives around how we make plans for improvement. So much of the time, we start with data and just roll on from there. We are conditioned to be data-driven, not data-informed. I always advocate for questions to drive the processes we use, not the data. 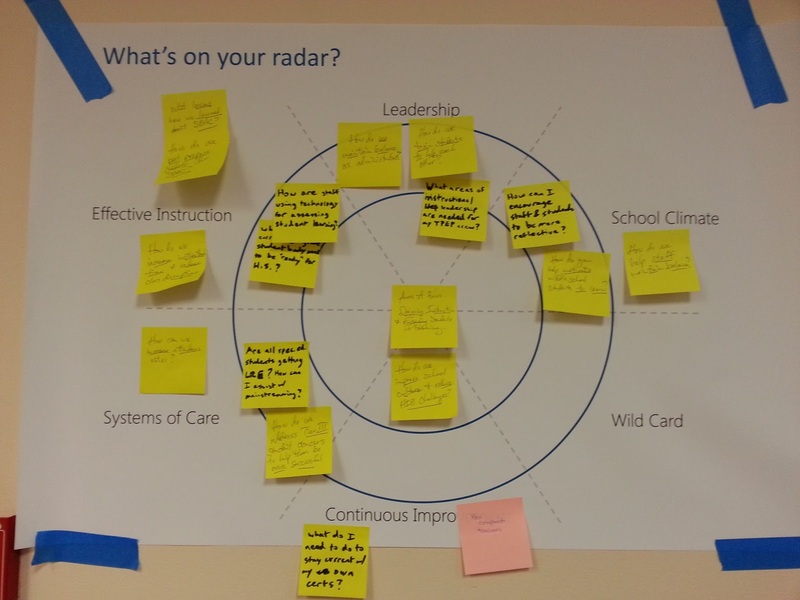 A human-centered approach starts with questions and concerns and builds from there. As educators, we know---or, at least we think we know---the issues within our schools. Data may show us that not all students are reading on grade level, but the issues may not be exclusively around teaching. Perhaps we need more resources in the library to develop a love for reading. Maybe we think a reading buddy would help kids build social-emotional skills as a way to gain purpose for reading. Lots of possibilities that go beyond "Teach harder." At Tapestry last month, Neil Halloran gave a talk on Emotional Statistics. While the content wasn't specific to human-centered design, it spoke to the practicality of building empathy into the data stories we tell. Sometimes, we leave a wild card slice so that people can have some space to raise issues that might not fit elsewhere. All of this leads to some great discussion and some thoughts then about how to build action plans around what ends up in the center. If you'd like to try this for yourself, you can download the instructions and radar template. At this year's ASCD annual conference, Empower 17, there were two sessions incorporating design thinking. The first, Design-inspired leadership, by Alyssa Gallagher and Kami Thordarson,was focused on re-envisioning the role of the principal. Based loosely on the Stanford Design School Model, the presenters defined design as the creation of artifacts that work. They suggested that we have the power to change the rules around how we use our roles as leaders. The design-inspired roles included the Opportunity Seeker, Experience Architect, Rule Breaker, Producer, and Storyteller. Of these, the Storyteller role is the most powerful, as it captures minds and hearts. As someone who reminds people to use data to tell your story as the tagline on her other blog, this last piece spoke to me. 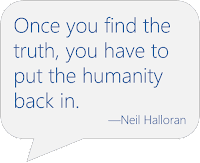 I think just as Halloran reminds us that the numbers---the truth---are all well and good, we need to be intentional about making these human connections. Patrice Dawkins-Jackson and Wendy Kelly led an extended session on Design inspired and habits of mind: Influencing instruction and beyond that combined the Stanford model with Costa and Kallick's Habits of Mind. They described design as a human-centered process using empathy to solve the real problem. Design is not about art (although it can be), but more about creative thinking. They led the group through a model of the process of keeping user needs at the center of the work. What I appreciated about both of these sessions was that they speak to a shift in the way we think about how we identify our goals and work toward them. Schools, as a rule, are not early adopters of ideas, technology, or much else. As another presenter at the conference opined, schools embrace business ideas (deficit-based approach, data-driven decision making, factory models...) as they are fading. We run many years beyond current trends, but better late than never, right? And if these sessions at ASCD are any indication, conversations about taking a design-approach are much more wide-ranging than I would have guessed. We build humans in education---not widgets. I know that there are thousands of teachers, coaches, principals, and others who see this everyday, but as a system, we are not so good at remembering this outcome. You don't have to be an artist to engage in design---you just have to care about the people affected by your efforts. We can use processes that honor that, as well as the data that are generated. There are additional posts about ASCD 2017 on my other blog. 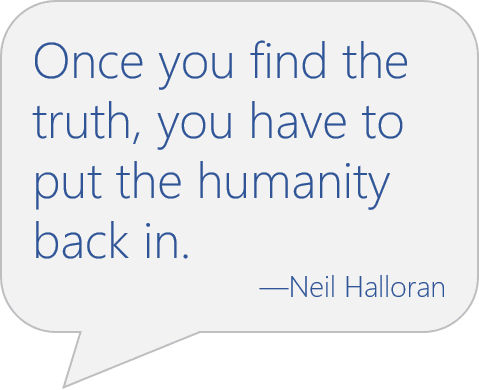 I shared what I learned on my annual roundup of data tools in the exhibit hall, as well as my own presentation on using qualitative data to put the humanity back into the truths we tell. Part of my day job is devoted to helping people in my district use data effectively. That could mean supporting the superintendent, working with teachers, or building tools for principals to monitor school improvement goals. The job is wide-ranging and is never dull. The challenge is to not only get people to think critically about the questions they want to answer with data, but also to have them think beyond student achievement. Discipline is on the left and attendance is on the right. 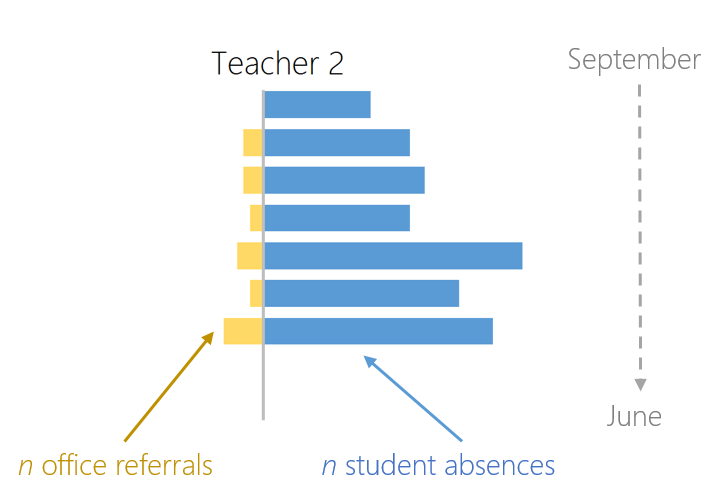 The total number of referrals and absences is represented for a given month, with September at the top and June (eventually) at the bottom. What do you notice? Do you wonder why Teacher 2 has so many more absences than Teacher 4? Or maybe why discipline referrals had such a jump for Teacher 4 in March? Something is going on with Teacher C. The number of student absences is way out of proportion for the rest of the grade level. 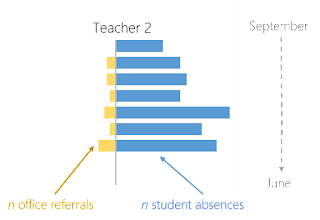 What are Teachers B and D doing to (a) get their students to school on a regular basis and (b) avoid referrals to the office? If you were a principal, where would you focus some resources? If you were a teacher, what would you think if you saw your classroom data represented this way? This display is not an end point. There are no numbers...just shapes and patterns and questions. But I like to think that if we provide some different ways to represent what happens in our schools that we can get to the types of conversations we most want to have. If you're interested in how to build these charts, the basics are posted on my Excel blog.